The newly-built Princeton Wawa, replete with the train station's *heated* waiting lobby, was an overnight oasis. Photo compliments of CJ A. ...Results will be submitted this week, and then become final pending ACP/RUSA certification. All 8 teams made it safely to the Quakertown finish for a 100% team finish rate -- congratulations to all the captains and their teams for another excellent result. 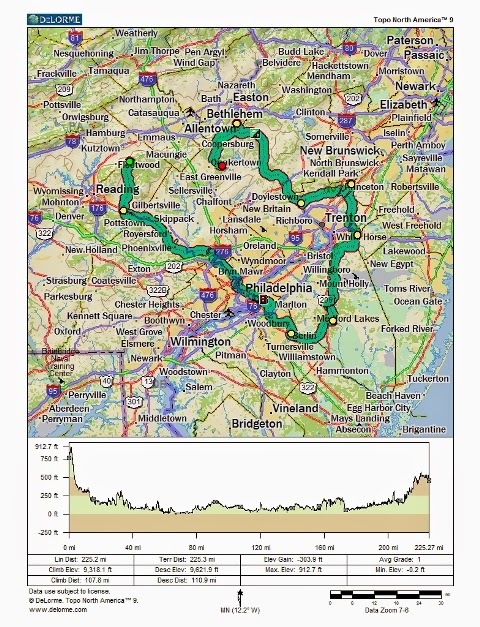 The Eastern PA Fleche is now in it's 8th year, and after some pretty rough years with stormy weather, we now have a 4-year streak of good weather going. However, as teams headed northwest will attest to, there were some pretty stiff winds to deal with. And overnight temperatures dipped below freezing as teams headed toward their 22-hr controle. On previous fleches, Bill F. has led a 2nd team of all fixed-gear riders. But this year, they decided to ride with gears as team '3 Rivers of Guiness' on a course through the rolling terrain of Lancaster. 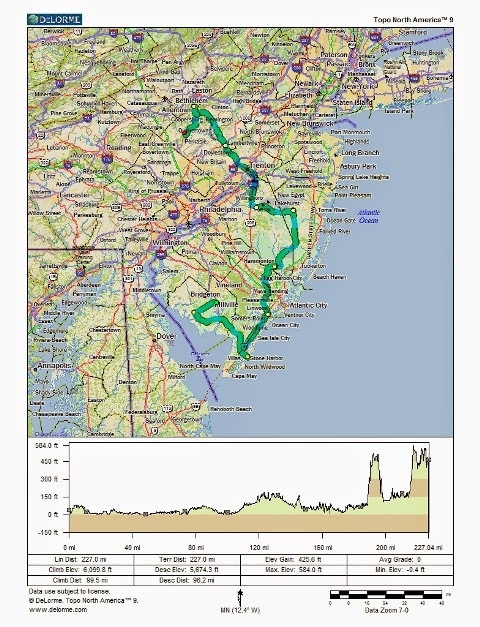 Having ridden a similar course with Bill F.and Rick C. in 2010 on team Squadra Bricconi, they get my vote as this year's over achievers. Bill F. is one of a handful of 7-time PA Fleche finishers. Team Cumberland County Cruisers was back again, this time under the leadership of Bill R. They have participated in all but one edition of the PA fleche and have a pair of 7-time finishers: Dawn E. and Rick L. With a course that generally headed northwest, they get my vote for having the most adverse conditions with stiff headwinds for most of their ride. CJ A. writes: "...I thoroughly enjoyed myself on my first flèche. Great weather, great teammates (on both squads! ), a great and semi-familiar route... what more could I ask for? ... Paul, Jon, and Katie provided the comedy, Captain Chris kept us in line, and Janice kept me going with her own silent resolve. The newly-built Princeton Wawa, replete with the train station's *heated* waiting lobby, was an overnight oasis.... a thing randonneurs dream about (or dream in!). I can now see why the Flèche is a fan favorite. Definitely on my calendar for next year. ..."
Team "Now You've Gone Too Far" under the leadership of Eric K. has in past years, earned my "Overachiever" vote. 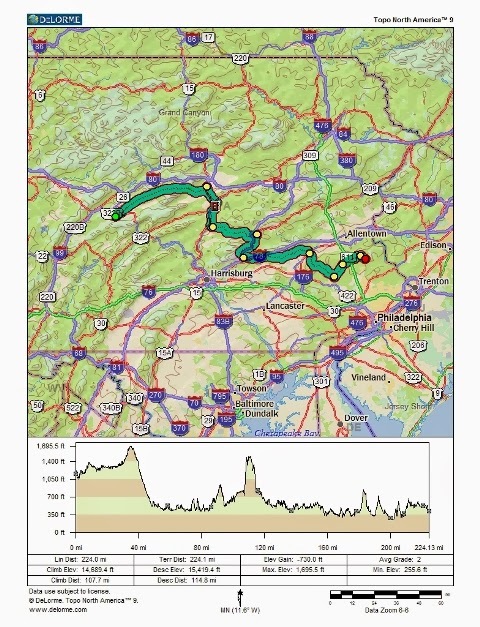 Their course generally follows the last day of the Endless Mountains 1240k. But this year they managed to avoid bonus miles, and once again enjoyed some favorable tail winds. Larry M. writes: "...It was very good to see you again early Sunday morning at our 7:45 am arrival! 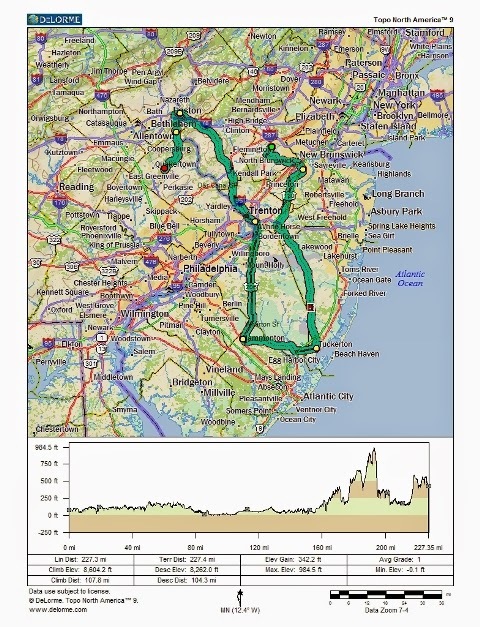 Riding with Eric K & Greg K worked out just perfect as our average pace of about 13 MPH kept us together at all times, especially during the cold (28F) hours of the early morning - it was 43F Saturday morning 8 am when we started from State College. What made the fleche route special for me was seeing the daylight versions of what I had cycled at night during the EM 1000 & EM 1240, especially on rt. 192 from State College to Lewisburg. And the opposite was true about riding at night what I cycled in daylight during the EM rides - like the endless double whammy climbs up Ruth Road, and then Church Road up to the glimmering Big White Church on the steep hill in the vicinity of village of Hereford. It had an erie feel as we did the steepest climb of our fleche route in the dead of night with the village lights all reflecting off the church steps, steeple and front doors. It was at this point I reflected on the New Jersey fleche route I did a few years ago which seemed like a powder puff roll in comparison. 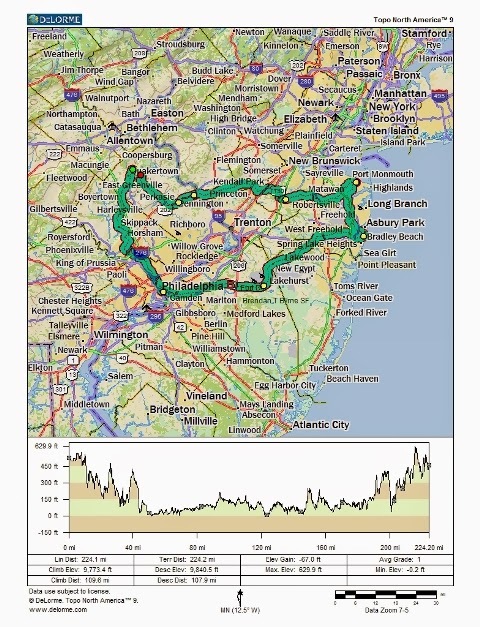 As always, kind regards for your hard work organizing these RUSA events, ..."
Sinister Nuts captain Bill O. has finished all 8 editions of the PA Fleche - quite a remarkable feat indeed! Guy H. is another 7-time finisher, and but for a certain volcano that erupted in Iceland one year leaving Guy stranded in the UK, he would most likely have 8 finishes as well. With a team of all first-time participants, team "Super Unknowns" under the leadership of Gil L. gets my vote for rookie of the year. They also get my vote for the most exciting 25k to the finish, arriving at the hostel with just a handful of minutes to spare. 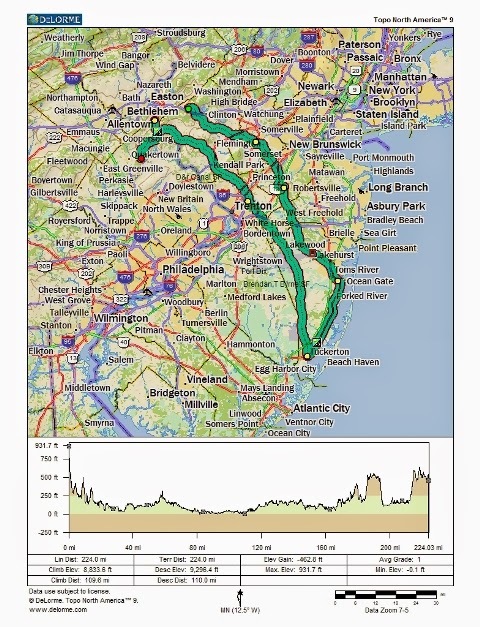 With a 22-hr controle near New Hope, they faced many sharp rollers through Bucks County as they headed to the finish. Thanks to all the team captains for all their hard work in coordinating their teams and planning. And special thanks to volunteers Jane and Joe B. for preparing the soup and chili, and all their help at the hostel finish. With so many teams this year, I couldn't have managed it without them. As usual, use the electronic registration on the website by Thursday if you want to join the roster.